A 60 year-old woman with bilateral pseudophakia and chronic open angle glaucoma decided to consult the eye department of Sarawak General Hospital after being under the care of a private ophthalmologist for the past 10 years. She was on latanoprost od, timolol 0.5% bd and trusopt bd to both eyes. The vision was 6/9 in both eyes with correction. Slit-lamp examination showed bilateral extracapsular cataract extraction and posterior intraocular lens implant via limbal incisions. The intraocular pressures (IOPs) were poorly controlled at 20mmHg right eye and 30 mmHg left eye. Fundoscopy showed cup disc ratio of 0.8 in both eyes. The visual fields showed bilateral arcuate scotoma being worse in the left eye. After two subsequent visits over two months in which the left IOP remained poorly controlled (28 mmHg and 29mmHg), she agreed to undergo left trabeculectomy with mitomycin C application. There was no problems perioperatively except for a thin flap near the limbus because of scarring from the previous limbal incision. However, her vision dropped to hand movement the next day and slit-lamp examination revealed hyphaema (Figure 1) which appeared to arise from the iridectomy. The fundal view was poor. The anterior chamber was deep and the intraocular pressure was 6mmHg. She was reassured and discharged home with topical homatropine and garasone (gentamicin + betamethasone). The hyphaema failed to resolve over the next seven days and the vision remained hand movement with poor fundal view. The patient was anxious and requested to have the blood evacuated. Figure 1. Hyphaema arising from the iridectomy. 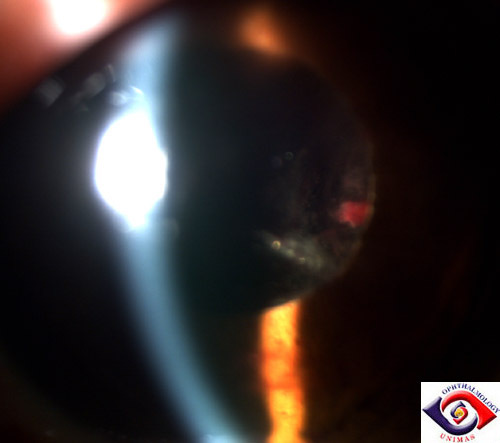 An anterior chamber wash-out was performed using Simcoe irrigation-aspiration cannula via a small corneal incision created using a keratome at one O'clock position. During the procedure, blood was noted behind the iris and behind the intraocular lens. The blood behind the iris was also aspirated. 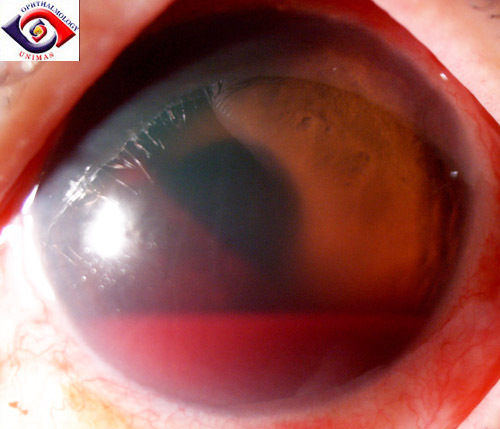 Post-operatively, the anterior chamber was free of blood but the fundal view was hazy due to vitreous haemorrhage. 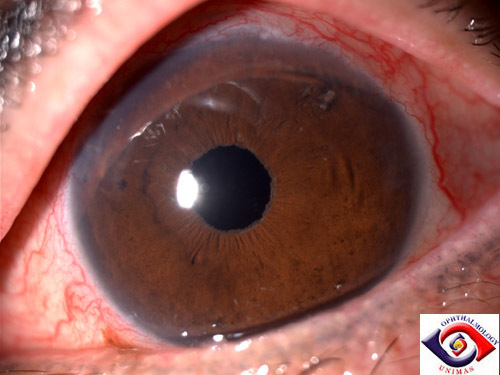 Vitreous strand was present in the anterior chamber extending from the inferior pupil and became incarcerated in the corneal incision wound (Figure 2 and 3). The IOP was normal at 9mmHg. 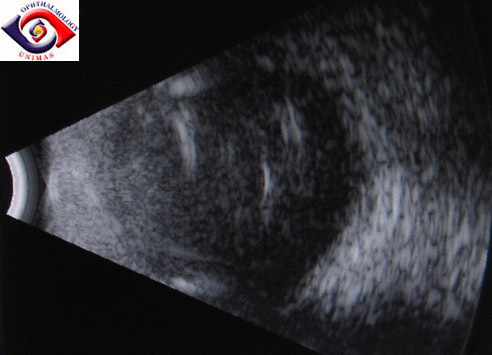 Ultrasound confirmed the presence of vitreous haemorrhage without signs of choroidal detachment (Figure 4). 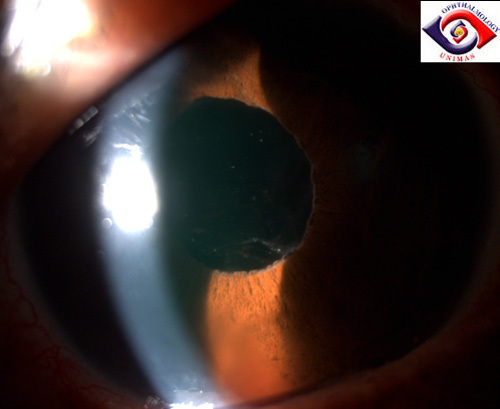 The patient was reassured that the vitreous haemorrhage will clear with time. Figure 2. Vitreous in the anterior chamber arising from the inferior pupil. Figure 3. Vitreous in the anterior chamber and blood can be seen behind the vitreous. Figure 4. B-scan showing vitreous haemorrhage. The patient returned 4 days later with a painful left eye. On examination, the vision remained hand movement and the left eye was severely injected. The intraocular pressure measured 60mmHg. She was treated with intravenous acetazolamide and topical timolol 0.5% bd which brought the IOP down to 38mmHg. Peripheral iridotomy was performed using both argon and YAG laser. The IOP was brought down to 18mmHg with only topical timolol 0.5% bd. However, the IOP increases to 38mmHg again four days later and the iridotomy was blocked by vitreous from behind the iris (Figure 5). Figure 5. Iridotomy blocked by vitreous. An anterior vitrectomy was performed to clear the anterior chamber and the pupil of vitreous (Figure 6). Post-operatively, the IOP rose to 28mmHg and required the combined use to timolol 0.5% bd and latanoprost od to bring it down to 18mmHg. The vision improved gradually over the next 4 weeks to 6/18 with spontaneous resolution of the vitreous haemorrhage. Figure 6. Rounded pupil one week after anterior vitrectomy. a. 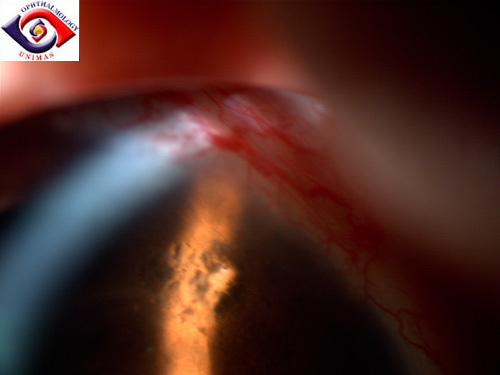 What may be responsible for the presence of vitreous haemorrhage in this patient? b. What is the cause of the high IOP following anterior chamber washout? c. What are the mistakes in the management of this patient?